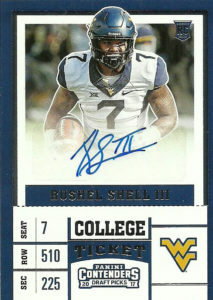 After a prolific high school career as a runningback, Rushel Shell III, played a year with Pitt in 2013. As a true Freshman he ran for 641 yards on 141 carries and 4 touchdowns. He transferred to West Virginia and piled up 450 carries for 2,010 yards and 20 touchdowns in 35 games. He also displayed a knack for catching the ball out of the backfield with 58 career receptions. Shell was considered undersized (5’10”, 227) for the rigors of the NFL, and was not selected in the 2017 NFL Draft. He’d sign as a free agent with the Pittsburgh Steelers, eager to show off his physical running style. He went through minicamp, but was oft-injured, and was cut after about 6 weeks. Currently he’s a free agent.